way. We will be in Florida for another week on vacation. from Day 1 to 5. i'm so blessed to have you as friends and classmates. Enjoyed the whole stay. You have such a good kid in Michael. The pictures are so fun. AuAu, Max, Tess, Promy, Nonah, Oscar. here in the Phils na pud. Thank you so much for sharing with us that special event - our Class 1978 35th (Coral) anniversary Reunion. It made me feel as if I'm just right beside you all out there - talking, laughing, cajoling, practicing, dancing, singing, eating, reminiscing, etc. Truly, as I've written in my TGIF: "A reunion is a time when we can be both childish and child-like without minding what others would say. It is a bringing back of that sense of belonging. It is a time for fellowship and camaraderie. A jubilation. A celebration. But most of all, a reunion is a time of thanksgiving - to thank God Almighty for giving us the privilege of reaching this far. Thank you, Lord, for the Gift of Life. Thank you, Lord, for friends and good times together..."
I also would like to extend my sincere thanks and appreciation to all those behind the making of our celebration a success. 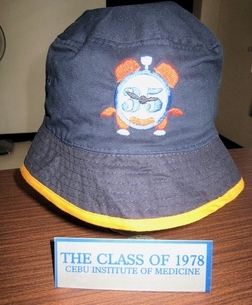 Yes, wa juy makalupig sa Class 1978. Hehehe. Oh, I could just imagine you all singing the Jubilee Hymn. Yes, we're coming home, yes, we're coming home.... to Cebu... come July 2018... for our 40th (Ruby) Anniversary. In God's Time. We have sat down and planned on this already. It's a work in progress. Hopefully, by then, there won't be any SARS scare or the like. and used the alternate route. Thank you for hosting . and cant take it out my head. Nice pictures, esp w Michael. All people were sooo happy. Did you really sing coming home? When will you all come home? Hehehe.